An important factor that affect the concrete production efficiency is the selection of concrete mixing station, the station selection includes: site selection, scale and the equipment type selection, function type four aspects respectively to introduce. 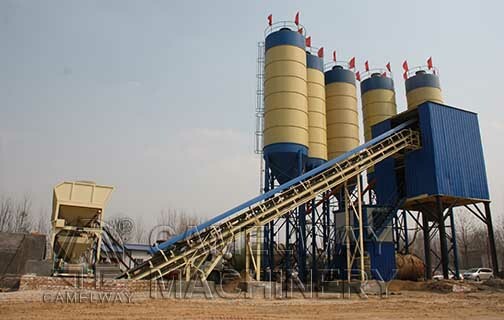 According to the size of the production scale to determine the production capacity of concrete mixing station equipment;According to the size of the factory to station, concrete mixing station, selection of the concrete mixing floor, aggregate a promotion, the same capacity of mixer productivity is higher than mixing station, overall modelling neat and beautiful, space occupied area is small, good production environment, but manufacturing installation cycle is long, one-time investment cost is high. Selects the site must be low one-time investment, site area is large, flexible layout, installation period is short;About attachment equipment selection, equipment condition according to the attachment to choose the specifications of the concrete mixing station and the work size, load capacity of the mixing transporter should match the mixer discharge ability, if improper matching affect work efficiency.Management function selection should consider the network of commercial concrete mixing plant equipment management functions, to avoid the difficult of the machine upgrade. As a professional concrete batching plant producer, we can provide high-quality products and professional suggestions. If you are interested in the concrete mixing equipment, please feel free to contact us.